Although Latino Americans, also known as Hispanic Americans, live throughout the United States, the states with the largest populations are California, Arizona, New Mexico, Florida, and New York. 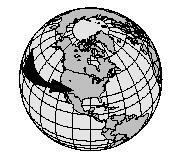 Latinos may be of any race, and may trace their family history to any of the countries where Spanish is the principal language (except Spain), particularly those in Latin America. The masculine form of the word is Latino, and the feminine form is Latina. 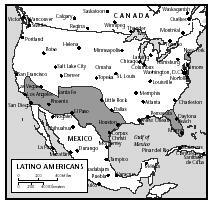 Mexican Americans have lived in the United States for most of the country's history. However, other Spanish-speaking immigrants did not begin arriving in large numbers until after World War II (1939–1945). Many Puerto Ricans arrived in the 1950s. Cubans, Dominicans, Colombians, and Costa Ricans immigrated in the 1960s. And, people from still other Latin American countries followed in succeeding years. As of 2001, the three largest Latino ethnic groups were Mexican American, Puerto Rican, and Cuban American. Like most immigrant groups, Latino Americans have remained loyal to the food traditions of their homelands. Many shop in small ethnic markets called bodegas that carry specialty foods used in Latin cooking. When they cook, they follow recipes handed down to them by their parents and grandparents. Specialty food companies have thrived by supplying Latinos with traditional cooking ingredients. The most famous of these is Goya Foods, whose products can be found in grocery stores throughout the country. The states with the largest populations of Latino Americans are California, Arizona, New Mexico, Florida, and New York. from other ethnic groups in their meals. In turn, Latin American cooking has become increasingly popular among non-Latinos. Although Latino Americans belong to a number of different cultures, their cooking styles have certain things in common. Meat, usually pork or beef, is central to the Latino diet. It is often eaten with the spicy sauces (salsas) for which Latinos are famous. The main ingredient in salsa, as well as many other Latin dishes, is hot chili peppers. Latinos cook with fresh, dried, and ground chilies. There are many different kinds of chilies, including Habanero, Jalapeno, Malagueta, and Poblano. Corn, beans, rice, and root vegetables are staples of the Latino diet. Some of the root vegetables commonly used in Latino cooking are sweet potatoes, yams, yucca, jicama, Jerusalem artichokes, and taro. Also popular is a pear-shaped squash called chayote. It goes by several other names, including tayote, chuchu, and xuxu. Latinos are able to enjoy many fruits native to their homelands, which are either imported or cultivated in the United States. These include plantains, guavas, mangoes, papayas, passion fruit, and prickly pears. Turnovers are very popular in Latino cooking. These are dishes that consist of a variety of dough and filling. Two popular types of turnovers are tamales and empanadas. Nacatamales, chuchitos, humitas, and bolos are just a few of the many types of tamales eaten by Latinos in the United States. Most Latino desserts (like flan, a type of custard) are made from dairy products. Most traditional Latino drinks contain two of the following three ingredients: milk, rum, and fruit. Place the onion and chilies into a bowl. Add the lime juice and a pinch of salt, tomatoes, and coriander, if using, and mix well. Let the salsa set for 5 minutes to allow flavors to blend. Serve with nacho chips, tacos, or grilled meat. Sauté onion, bell pepper, and garlic. When the pieces of onion become clear, add salt and tomato paste. Reduce heat to low and cook 2 minutes. Stir in the beans and rice. Pour the liquid from the beans into a large measuring cup and add enough water to make 2½ cups of liquid. Cover and cook on low for 45 to 50 minutes, or until liquid is absorbed and rice is cooked. Plantains are a large, thick-skinned variety of banana available in specialty stores. Heat the vegetable oil in frying pan and cook plantains over low heat. Mix the garlic with water in a bowl. When the pieces of plantain are soft, mash each one between two sheets of waxed paper. Then soak them in the water and garlic. Re-fry the pieces of plantain in hot vegetable oil until they are golden brown. 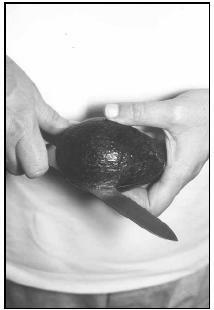 To prepare an avocado for use in guacamole, first cut all the way around it carefully, so that the two halves can be gently twisted apart. Add all of the ingredients except the tomato into a bowl. Use a fork to mash the avocado and the other ingredients together. After dicing the tomato, stir the small pieces into the bowl with a spoon. Cover the bowl with plastic wrap and put it in the refrigerator for 1 hour. Serve as a dip with tortilla chips, as a sauce on top of tacos or burritos, or as topping on a baked potato. The vast majority of Latinos are Roman Catholic and celebrate the holidays of the Christian calendar. Making tamales and pasteles together is a popular family tradition around the Christmas holidays. Both consist of dough wrapped around meat or some other filling. The tamale dough is placed inside an empty cornhusk. The pastele dough is placed inside a wrapper made from banana leaves. Another Christmas favorite is menudo , a spicy stew made with hot chilies and a cow's stomach (called tripe). A special Latino New Year's Eve tradition is to eat twelve grapes or raisins at midnight. They stand for the twelve months of the new year. Adults often welcome the new year with a drink that contains rum and tropical fruit. It is poured into a punch bowl, and a whole pineapple is put in the bowl. It is said that the people who drink this beverage will enjoy friendship throughout the coming year. On New Year's Eve, Latinos of Colombian descent enjoy a dessert called bunuelos . These are balls of dough made from flour, sugar, eggs, and butter and deep fried. On Good Friday, three days before Easter, a soup called potaje do vigile is served in many Latino homes. It is made with garbanzo beans, fish, and spinach. It also contains egg yolks, garlic, almonds, and seasoning. Fry each tortilla, one at a time, in hot oil over medium to high heat until crispy. This should take about one minute on each side. Combine the other half of the cinnamon mixture with the corn flake crumbs in another small bowl. Pour the corn flake mixture into a wide shallow bowl or plate. Using two forks, gently roll the scoop of ice cream around in the corn flake crumbs until the entire surface is covered with a crunch coating. Place the ice cream scoop on the center of the cinnamon/sugar-coated tortilla. Spray whipped cream around the base of the ice cream. Spray an additional pile of whipped cream on top of the ice cream. Put a cherry in the top pile of whipped cream. Repeat for the remaining scoop of ice cream. Place chicken on flat roasting pan and bake for one hour or until done. When the chicken is cooked, cut into small pieces. Mix all the ingredients except olives and peppers and season to taste. Garnish with red peppers and olives. Optional: Form flowers with the peppers as petals and olive in the middle. Serves 12. Most Latinos eat three meals a day. The main meal is eaten at dinnertime. Eating together with the family is important to Latinos. Many families pray together before meals. Busy schedules sometimes keep families from eating together during the week. On Sundays, they can still gather to cook together and share food, prayer, and the latest news. Many Latino children have Sunday dinner with their aunts, uncles, grandparents, and cousins. In the past, most Latinos ate large, home-cooked meals every day. Foods were made from traditional recipes that were hard to prepare and were time consuming. As more women have entered the work force, there is less time to cook some of these traditional foods. Also, Latinos, like other Americans, eat out more than they used to. Some even gather in restaurants for the big family dinner on Sunday. Each Latino ethnic group has its own food customs and traditions. Cubans consider many foods symbolic. For example, sweet foods symbolize happiness. Fruits are often the main part of a Cuban meal. Puerto Ricans are known for their love of fancy meals. Many Puerto Ricans still serve a wide variety of dishes at two of their meals every day. Mix all the ingredients in a blender or food processor and season to taste. If desired, add 1 Tablespoon of wine vinegar and 1 teaspoon of olive oil. Ladle soup into individual bowls and serve chilled. Prepare the corn bread mix according to the instructions on the box (do not add sugar). Cut the tomatoes into small pieces and drain the excess juice and seeds. Add them to the corn bread mixture along with the hot chili powder and mix well. Bake the corn bread in a lightly greased bread pan according to instructions on the mix package. Cut the bananas into slices about ⅓-inch thick. Mix all the ingredients and serve in individual bowls. The Bureau of Census reports that the Hispanic population in the United States is the fastest-growing minority population, and projects that it will be the largest minority population by 2010. A number of health concerns face the Latino population. For recent immigrants, language barriers and unfamiliarity with health care resources (or lack of health insurance) may prevent them from seeking preventive health care. Mexican Americans and Puerto Ricans are two- to three-times more likely to develop diabetes than non-Hispanic whites. Risk factors such as family history of diabetes, obesity, and physical inactivity all increase a person's chances of developing diabetes. Illsley, Linda. Food and Festivals: Mexico. Austin, Tex. : Raintree Steck-Vaughn, 1999. Menard, Valerie. The Latino Holiday Book. New York: Marlowe & Company, 2000. Novas, Himilce, and Rosemary Silva, Latin American Cooking Across the U.S.A. New York: Knopf, 1997. Rexach, Nilda Luz. The Hispanic Cookbook. New York: Citadel Press, 1995. Etznab's Latino Recipes. 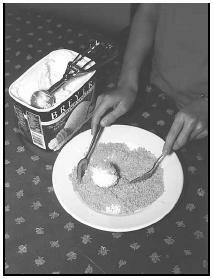 [Online] Available http://www.geocities.com/NapaValley/7035/icecream.html (accessed April 2001).